(left to right) Gustavo Velasquez of Urban Institute, Ernst Valery of SAA | EVI and Nicky Goren of Meyer Foundation discuss the causes and consequences of redlining at HAND’s Annual Meeting & Housing Expo. In the US, descriptions of housing affordability challenges and differences in wealth, health, and education need to include a racial equity lens, or the picture is incomplete. Legally authorized and mandated housing discrimination through federal lending and investment policies laid the cornerstone of complex socio-spatial issues that historically segregated communities continue to face. Many of the inequities within and between neighborhoods, particularly in large metropolitan areas, trace their roots to redlining. …Meaningful and inclusive community revitalization can break down some of the barriers instituted through disinvestment and discrimination. This can be done through equitable development, but it requires intentional engagement and community input. Community development corporations (CDCs) and community land trusts (CLTs) have facilitated this engagement. While CDCs and CLTs usually have residents on their boards, CDC leadership often does not represent those they serve, which can leave residents feeling disengaged. At the annual meeting of HAND, a membership organization for housing providers in Maryland, Virginia, and Washington, DC, Ernst Valery, founder and president of EVI Equity, addressed this challenge. He said, “We think so much about renovating the building, we need to also renovate the people.” EVI purchased Essex Village, an apartment complex in Henrico County, Virginia, that was far from providing its residents with a platform for success in life; according to Valery, it has been deemed the county’s worst apartment complex. EVI and the property manager CAPREIT quickly formed a tenants’ association to ensure that Essex Village residents were involved early in the planning process. Residents expressed excitement that the new owners wanted to hear their voices and to collaborate on creating lasting change in the housing development. When tenants are offered a seat at the table, they are eager to get involved, but developers need to provide the space to be heard. 0 Comments/in Uncategorized, HAND News, HAND Thought Leadership /by H.A.N.D. In the aftermath of the recession and housing market downturn, residential construction activity has been increasingly fairly steadily. However, the pace of new housing construction remains below long-term levels and the types and prices/rents of new housing being produced does not sufficiently meet demand. As demand for home ownership increases, the population of younger renters grows more slowly, and the number of lower-wage workers expands in the region, there is a great need for lower-priced home ownership opportunities and apartments and other rental homes with lower rents. Residential construction activities to grow steadily but still remains below long term levels regionwide. Over January through November of last year, there were about 22,000 permits issued for the construction of new residential housing units. 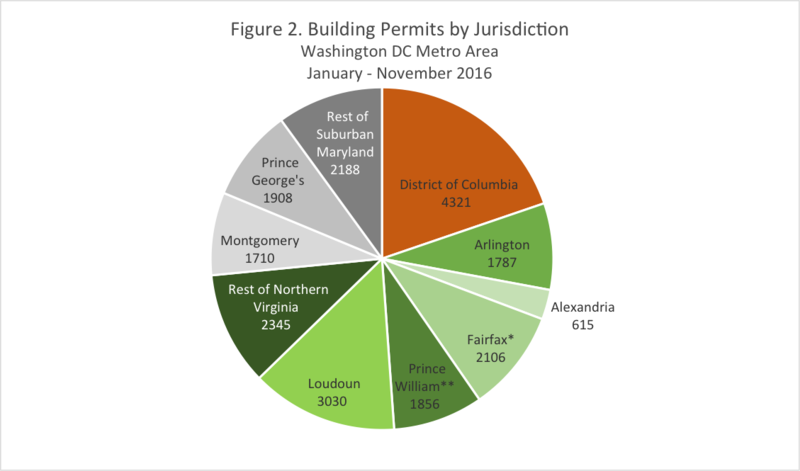 The 2016 residential permitting activity included 4,321 building permits in the District of Columbia, 5,806 building permits in Suburban Maryland, and 11,739 building permits in Northern Virginia. Residential permitting activity in the region has been increasing steadily since 2009, but remains below the 2000-2016 annual average (~25,000), suggesting that new home construction has not been sufficient to meet the demands associated with population growth. One-fifth of the residential construction activity in the region was in the District of Columbia in 2016. 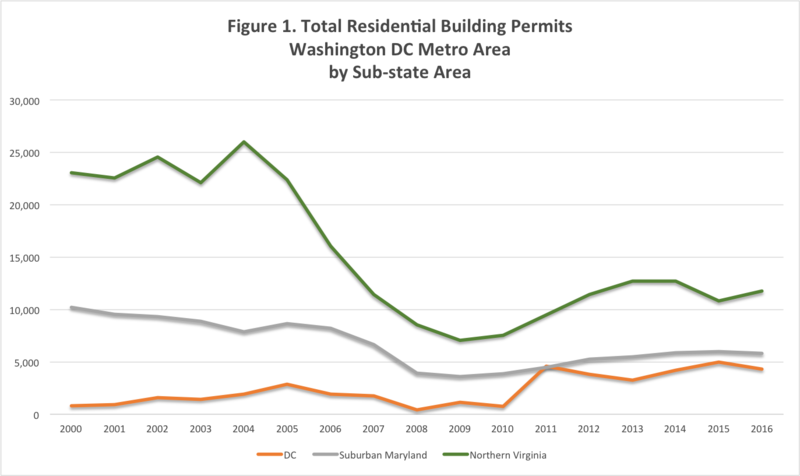 While residential construction activity has increased throughout the region, the District of Columbia still accounts for one-fifth of new permits. 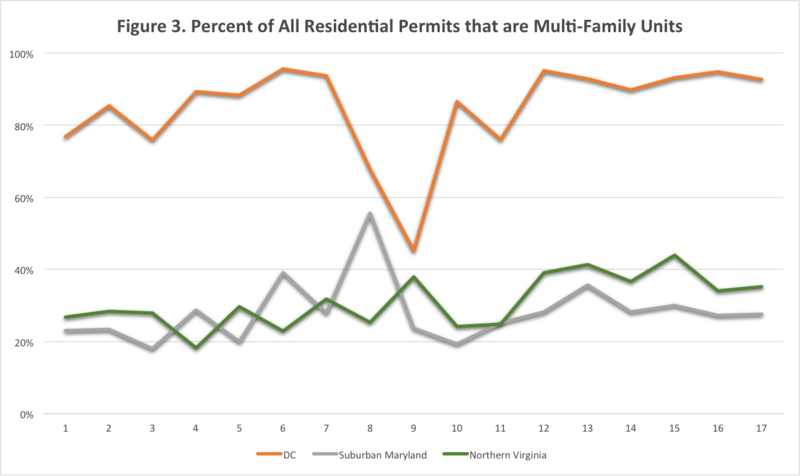 About a quarter of the permits were for housing in Suburban Maryland and a little over half were in Northern Virginia. By contrast, before the recession, only about five percent of permits for new residential units in the Washington DC region were in the District of Columbia. The District’s share of new permits has slipped slightly, to 20 percent in 2016 from 23 percent in 2015. 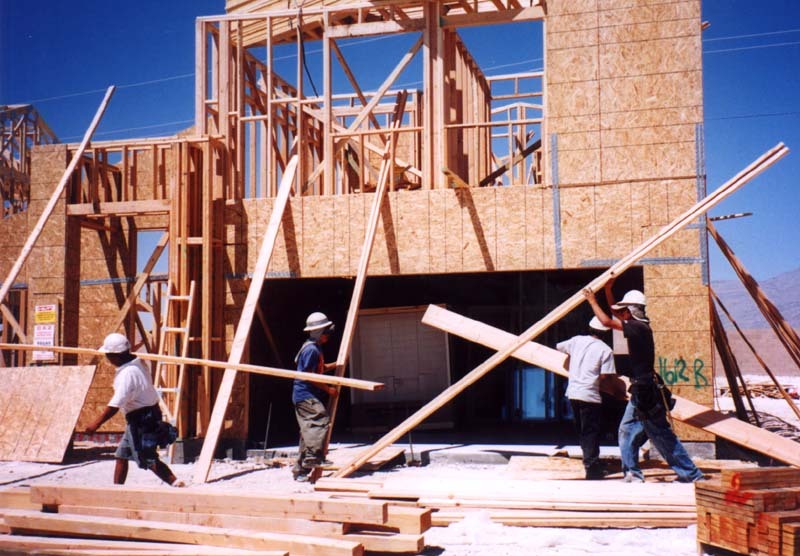 Multi-family construction remains strong though new single-family construction is on the rise. In 2016, 44 percent of permits for new residential construction in the Washington DC region were for multi-family units, including nearly all (93 percent) of the permits in DC, 35 percent in Northern Virginia and 28 percent in Suburban Maryland. Historically, over the past 16 years, about 38 percent of permits in the region were for multi-family units so the current share remains higher than average. However, over the past two years, the share of multi-family units has declined somewhat, generally because of a slight decline in the share of permits issued in DC. Home prices and rents in the Washington DC region continue to climb. Recent data from MRIS have shown that home prices in the metropolitan area have now matched the record high set during the housing market boom. The median sales price in December 2016 was $410,100, slightly higher than the previous record high price of $408,000 in 2014. As typical, there is wide variation in home prices throughout the region that reflects location as well as home types. 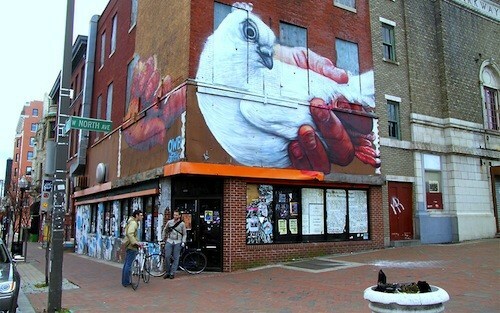 For example, in the District of Columbia, the median sales price was $550,000. In Fairfax County the median home price was $470,000 and in Prince George’s County was $265,000. Rents have also been on the rise, and new multi-family construction has skewed substantially towards luxury, higher-rent apartments. Even as concessions at new apartment buildings have increased, rents in buildings, particularly in DC and in the closer-in suburbs, are often only affordable to very high-income renters. According the 2015 American Community Survey data, the median rent in DC was $1,417 in 2015; however, the median rent for units built in 2014 and 2015 was $2,334. A household would need an income of more than $93,000 in order to afford the median rent in a new apartment building in the city. Homelessness remains an intractable problem in the District of Columbia. Even as new residential construction increases, there remains insufficient housing affordable to all residents in the region. A recent survey by the U.S. Conference of Mayors found that Washington DC has the highest rate of homelessness among the nation’s 32 largest cities. The ability for the region to expand the housing supply will depend not only on land use and zoning changes that encourage more housing, but also policies that promote the development of housing for our region’s most vulnerable residents. 0 Comments/in HAND News, HAND Thought Leadership /by H.A.N.D. Photo courtesy of the NAACP Legal Defense and Educational Fund, Inc.
Fair housing never emerged as an issue in the presidential election; however, the new President and his HUD secretary and Attorney General will have responsibility for overseeing the enforcement of new fair housing laws, including the Affirmatively Furthering Fair Housing (AFFH) rule and the disparate impact court decision. There is uncertainty about what a Trump Presidency will mean for housing nationally, but given his selection of Ben Carson as HUD Secretary, it seems more important than ever to re-commit to working regionally to support the goals of fair housing and access to opportunity here in the Washington, DC metro area. It has been over a year since the U.S. Department of Housing and Urban Development published the Affirmatively Furthering Fair Housing (AFFH) rule that established a new housing needs assessment process (replacing the analysis of impediments) with the Assessment of Fair Housing (AFH). The AFFH rule lays out a new procedure for local jurisdictions to assess areas of concentrated poverty, to identify disparities in access to good schools, transit and other amenities, and to evaluate unmet housing needs among certain subpopulations, including racial and ethnic minorities and persons with disabilities. In addition, for the first time HUD is providing a trove of local data to help localities identify patterns of demographic change. The goal of the AFFH rule is to bring greater guidance to localities for “affirmatively furthering fair housing” as mandated in the Housing Act of 1968. Despite some of the rhetoric, the new regulations reflect only an incremental change to HUD’s approach to enforcing fair housing and is designed to encourage a more intentional assessment of whether the goals of the Fair Housing Act are being met. However, the AFFH rule has been castigated as a vast overreach by the Federal government into local autonomy, and the change in leadership at the Federal level will likely give broader voice to those claims. During the campaign, President-elect Trump said he wanted to dismantle the AFFH rule. Donald Trump’s company has been sued by the Justice Department for violating fair housing laws in New York. In the 1970s, Trump’s father was arrested in Prince George’s County while allowing an apartment complex he owned fall into disrepair and for subjecting African American tenants to deplorable housing conditions. It’s not likely that a President Trump will take the lead on promoting fair housing from the White House. Trump’s pick for HUD Secretary, Ben Carson, has given every indication that he will not be a champion for fair housing at the Federal level either. He has called the Affirmatively Furthering Fair Housing Rule a “mandated social-engineering scheme” and a policy indicative of a “communist” country. 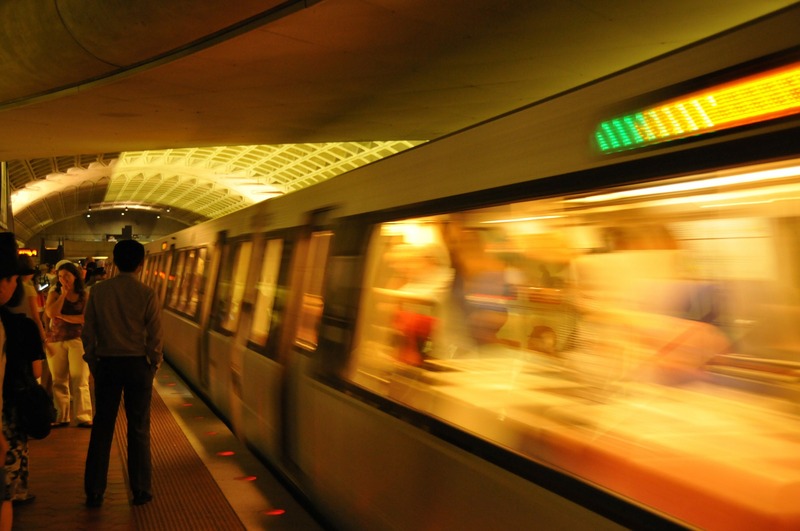 With likely backpedaling on AFFH at the Federal level, the Washington DC metropolitan area should remain committed to advancing fair housing in the region. Now, more than ever, local elected officials need to be leaders for promoting access and opportunity for all members of our community. Regional discussions about AFFH are already underway. 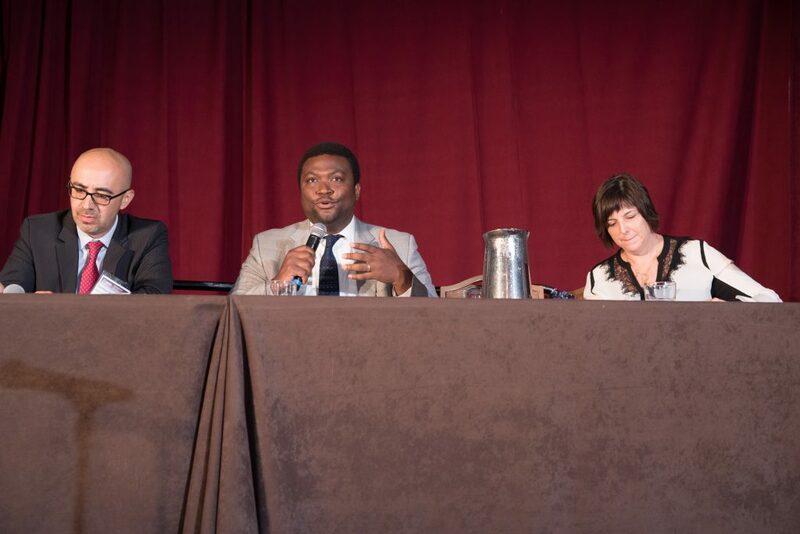 Last spring, the Metropolitan Washington Council of Governments partnered with Enterprise Community Partners and the National Housing Conference to host a full-day training and information sharing session around the AFFH rule. The primary objective of the convening was to discuss the data component of the assessment tool but the conversation shed light on the entire AFH process. At the meeting, we had representatives from HUD, as well as from the Baltimore area, which recently completed a regional housing plan. This meeting led to further discussions among local Housing Directors at the Metropolitan Washington Council of Governments (MWCOG), but momentum around AFFH slowed over the summer. Given the road ahead, now seems like a good time to re-energize regional partners around fair housing. The lack of Federal leadership is one important reason for mobilization. But there is increasing evidence that regions that are more racially and economically integrated have stronger, more resilient local economies. 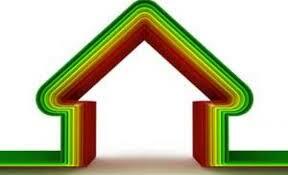 Produce data on housing needs and opportunities more efficiently. We learned in our March AFFH meeting that HUD is providing a tremendous amount of data to localities, but jurisdictions are advised by the new rule to make use of locally-generated data. Rather than each jurisdiction analyzing its own data, MWCOG should facilitate a regional data analysis exercise that can help with local housing plans but also help jurisdictions connect regionally. Consider a regional assessment of fair housing. HUD recommends, though does not really incentivize, a regional approach to assessing housing needs and developing strategies. While each local jurisdiction in the Washington DC area will still develop its own financial, land use and other tools to meet local housing needs, there may be some degree of regional assessment that could be undertaken. Local elected officials, along with housing and planning directors, should become better informed about what it would take to do a regional assessment of fair housing, and whether some type of regional approach is possible. Share best practices. At the very least, local jurisdictions in the Washington DC region need to do a better job at sharing best practices for expanding housing options. In the last few years, many jurisdictions in the region have conducted housing studies that have led to the development of policy recommendations. The policies and plans should be shared across jurisdictions through MWCOG or another regional body so that jurisdictions can learn from each other and possibly help promote consistency in policies and regulations throughout the region. Focus on community engagement. There is no silver bullet that we have yet to discover that will solve our region’s housing challenges. Jurisdictions in the Washington DC region are among the most innovative communities in the country in terms of affordable housing tools. We know what needs to be done. The major obstacle that remains is building political will and responding to community opposition to housing, particularly multi-family housing and housing affordable to low-income individuals and families. We should work together to solve the NIMBY (not in my backyard) issue by figuring out how to respond to concerns about density, schools, and parking; how to provide elected officials with education and information they can use at public meetings; and how to have conversations that promote inclusion and tolerance. On that last point, I think there would be a lot of people in our region who would want to be part of that conversation right now. 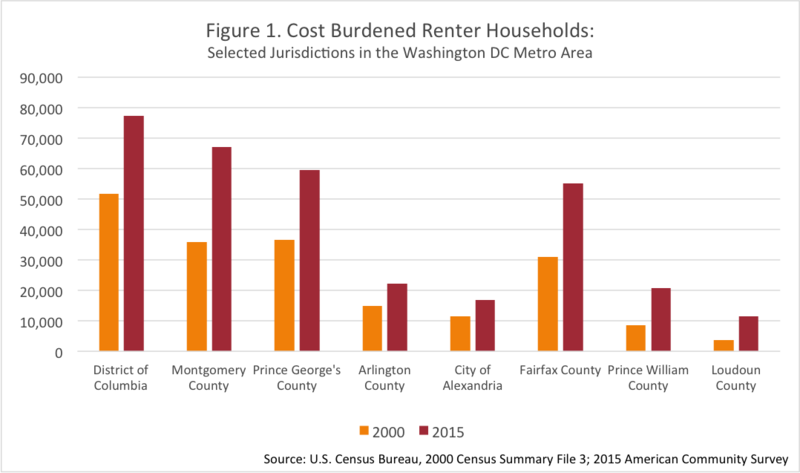 According to recent American Community Survey (ACS) data, more than one in five households in the District of Columbia is severely cost burdened, including 27 percent of renters and 12 percent of home owners. When individuals and families pay a disproportionately high share of their income on housing—50 percent or more—they often face challenges paying for other necessities, including food, health care, child care and transportation. In DC, about 60,000 households face this challenge. However, the rates of severe cost burden vary substantially for different segments of the population. Demographic characteristics like age and immigration status matter, but household income is the primary determinant of whether a household is severely cost burdened. While not surprising, this suggests opportunities for the housing industry and workforce development organizations to work together to expand housing options by both increasing the housing supply and growing incomes of residents of DC and the rest of the region. Some populations in the District are more likely than others to face affordability challenges. The rate of severely cost burdened households is higher among renters (27.4 percent) than for the overall population. 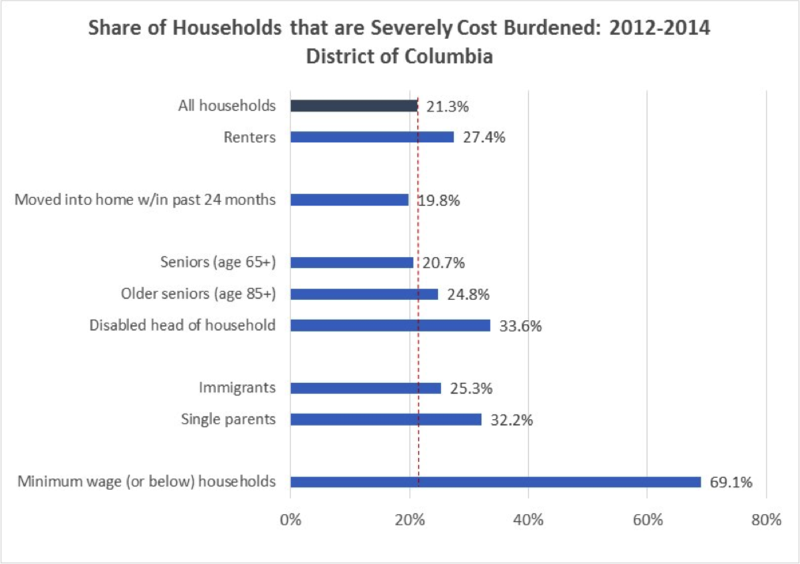 While seniors age 65 or older are just about as likely as the overall population in DC to be severely cost burdened, the challenges are greater for the more vulnerable 85+ senior population (24.8 percent are severely cost burdened) and people with disabilities (33.6 percent are severely cost burdened). Single-parent families and immigrant households are also disproportionately cost burdened, with rates of severe cost burden of 32.2 percent and 25.3 percent, respectively. But the single biggest factor that is associated with cost burden is income. 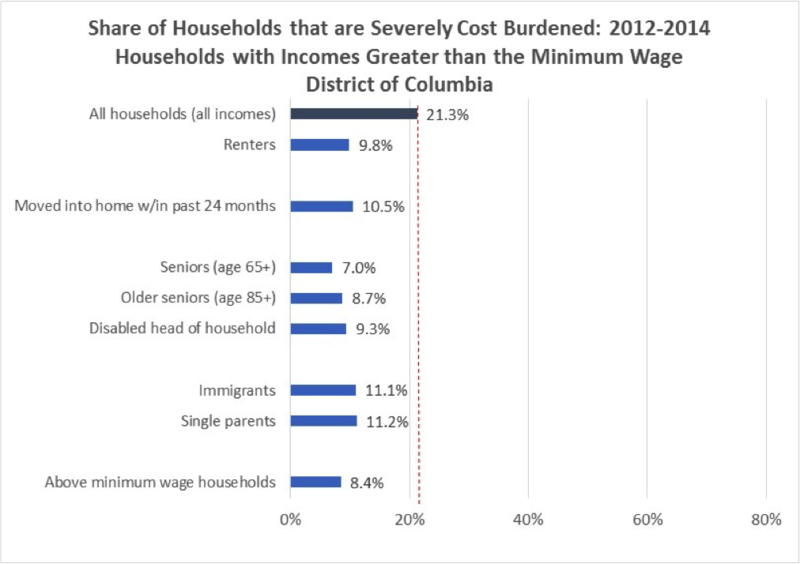 Most low-income families and individuals find it difficult to find affordable housing in the District, including households with full-time workers. An individual working a full-time job at the city’s minimum wage (currently $11.50 per hour) would earn about $24,000 a year. Nearly 70 percent of households with incomes at or below this full-time minimum wage worker salary are severely cost burdened, paying half or more of that income every month towards housing costs. This group of lower-income households includes non-working households, as well, but this particular statistic is emblematic of the struggles of low-wage working households in the city and, indeed, throughout the region. Look what happens when you examine the rates of severe cost burden only for households with incomes above the city’s minimum wage. The rates of severe cost burden are significantly lower for all groups with a household income higher than what a full-time minimum wage worker would earn in a year. 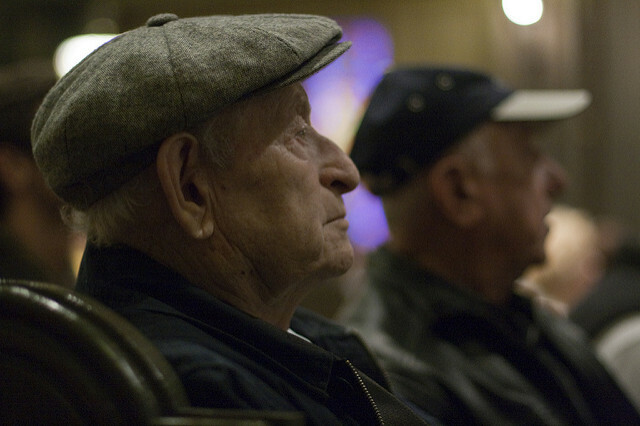 About nine percent of these higher-income older seniors (age 85+) and immigrants are severely cost burdened. Among single-parents and immigrants, about 11 percent are severely cost burdened if they earn income greater than the full-time city minimum wage. These shares are dramatically lower than for the same groups that earn lower incomes. The District of Columbia is among a growing number of states and localities that has instituted a minimum wage that is higher than the federal minimum and has planned increases. By 2020, the minimum wage in DC is set to rise to $15 per hour. A full-time, year-round worker at this wage would earn $31,200 annually. In Maryland, the statewide minimum wage increased from $8.25 to $8.75 per hour in October but in Montgomery and Prince George’s counties, the local minimum wage is $10.75 per hour. In Virginia, the minimum wage remains at the Federal level of $7.25 per hour. Advocating for a higher minimum wage—or a living wage—in the region’s jurisdictions would help put more money in the pockets of people in lower-skill, lower-wage jobs. With more money, it could be easier for these individuals and families to find housing they can afford. However, it is possible—though by no means conclusive—that an increase in a local minimum wage could actually lead to increases in rents at the lower level. A coordinated effort of increasing wages AND expanding housing supply is the best way to ensure wage gains translate into access to more affordable housing in the city and in the wider Washington DC region. To that end, the housing industry and workforce development community should have a shared goal of working together to help alleviate the challenge for the many households living with incomes that are too low and housing costs that are too high. You can’t hide from media reporting on Millennials and home ownership. But the message tends to be oversimplified and often contradictory. Millennials are getting set to jump into home ownership. Millennials are walking away from home ownership. 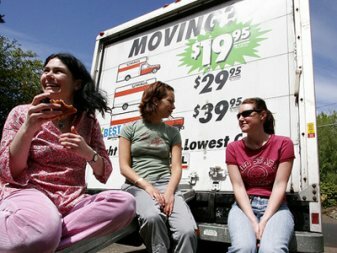 Some reports say student debt is the reason Millennials can’t buy a home. Others say it’s not. The attention to Millennials housing choices is justifiable. The generation of Millennials—those roughly age 18 to 34—have surpassed the Baby Boomers as the nation’s largest generation and are in prime household formation. Furthermore, surveys of Millennials uniformly find that the vast majority of this population wants to be home owners. For these reasons, Millennials will potentially have an enormous impact on the nation’s housing market. As we know, however, housing markets are local. The Millennial population in the Washington DC region tends to be more highly educated and have higher incomes than Millennials in other parts of the country. But home prices are also substantially higher in the region than they are in other places. 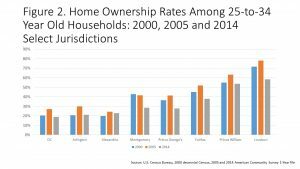 So what are the prospects for home ownership among 20- and 30-somethings in the DC region and how will their choices and the constraints they face impact their ability to accumulate wealth through home ownership? 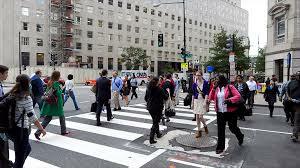 There are about 1.5 million people between the ages of 18 and 34 in the Washington DC metropolitan area. 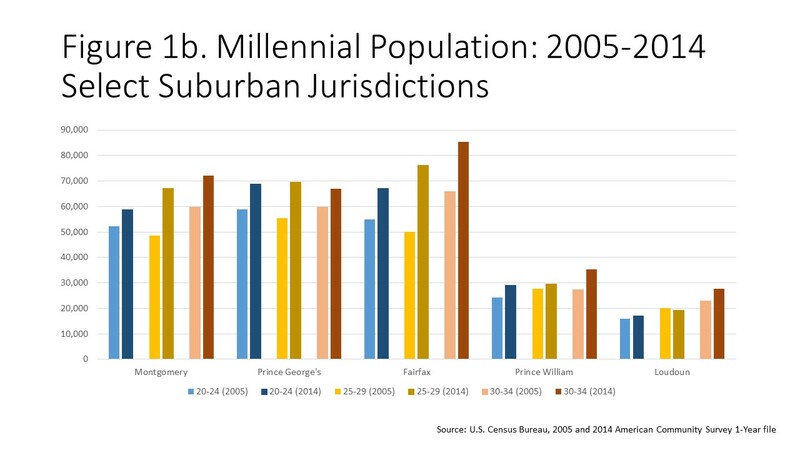 The shares of Millennials tend to be higher in closer-in jurisdictions like the District of Columbia (35%) and Arlington County (34%), but Millennials make up substantial shares of the population in the region’s suburbs, for example in Loudoun County (20%) and Montgomery County (21%). The housing choices this group is making now and will make in the future depends on their economic situations and choices about marriage and family, as on the available housing opportunities in the region. These factors combined will determine the extent to which young adult households in the Washington DC region will be longer-term renters than past generations—or will move out of the region where they find more affordable home ownership opportunities. 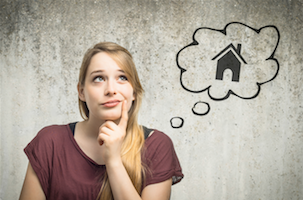 There are two key decisions individuals make that are relevant to understanding home ownership potential among Millennials—whether or not to form an independent household (measured by headship rates) and whether to rent or buy (tenure choice). Headship rates are defined as the percentage of people that are heads of households. The main way young people become the head of a household is when they move out of their parents’ home. Households are also formed—and therefore headship rates are higher—when roommates that are living together decide to live on their own. Headship rates decline when individuals living alone get married or move in together. Headship rates for the 25-to-34 year old population were lower in 2014 than in 2005 or 2000. (The focus in this section is on the older Millennial population who are most likely to be looking at home ownership.) 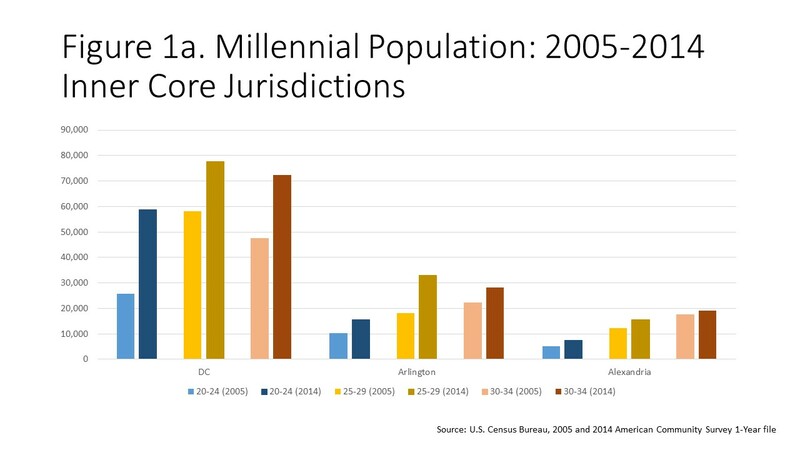 Therefore, young adults in the Washington DC region are not forming independent households at the same rate as they did at the height of the housing market or even back during a more “normal” housing market. The biggest decline in headship rates were in Prince William and Prince George’s counties. These are the jurisdictions that were hardest hit by the foreclosure crisis and also tend to have lower household incomes that in other jurisdictions in the region. Home ownership rates have fallen pretty substantially since the height of housing market and the declines have been biggest among young adult households. Perhaps, surprisingly, though, home ownership rates have rebounded more quickly in the District and Arlington—places with some of the highest housing costs—than in many other places in the region. 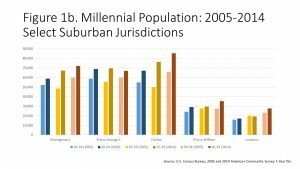 For example, the home ownership rate among 25-to-34 year olds in the District was 18.9 percent, lower than the 2005 rate of 27.2 percent but not too much lower than the rate among this age group in 2000. In Arlington County, the home ownership rate was over 30 percent for 25-to-34 year olds in 2005. The 2014 rate of 21.1 percent, however, is in line with the rate in 2000. The biggest drops in home ownership have been in Montgomery and Loudoun counties. One conclusion from these trends may be that home ownership opportunities have rebounded for the highest income Millennials who are able to buy in the District and close-in locations but remain limited for young adults with more modest incomes. Most young adult households do not earn above the area median income and the vast majority of homes on the market are unaffordable to them. In 2015, the median income for a household headed by someone age 25 to 44 was $92,326. (Data were not available specifically for the 25-to-34 year old population; however, the median household income for this younger cohort will be lower.) Under standard assumptions, a household with an income of about $92,000 could afford to purchase a home priced at about $370,000 (four times income). However, options are few in many parts of the region. 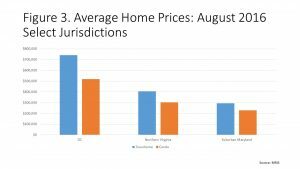 In the District, the average sales price of a condo in August 2016 was nearly $520,000 and the average townhouse price in the city was over $740,000! In the broad Suburban Maryland and Northern Virginia regions—which includes Frederick, Charles and Calvert counties in Maryland and areas south to the Fredericksburg area and west to Fauquier and Clarke counties in Virginia—prices were lower. The average condo in Northern Virginia was about $300,000 and it was about $230,000 in Suburban Maryland. The average townhouse sold for $406,000 in Northern Virginia and $293,000 in Suburban Maryland. But prices were much higher closer in and in areas well connected to jobs, transit, and amenities. For example, in the City of Alexandria, the average two-bedroom townhouse sold for $590,000 in August 2016. In Arlington, the average condo sold for $430,000. 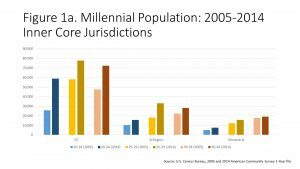 Will Millennials in the Washington DC region become home owners at the same rate as past generations? Probably not. Overall, they definitely won’t become home owners as easily or as young as Gen X’ers and Baby Boomers did. There are several implications of the delayed and abandoned home ownership among Millennials. Many Millennials will rent for much longer than they anticipated. As a result, many young adult households will not be able to take advantage of historically low interest rates and will not be able to start accumulating wealth through home ownership. While some may choose to rent, others will rent long-term out of necessity and will be subject to rising rents each year. 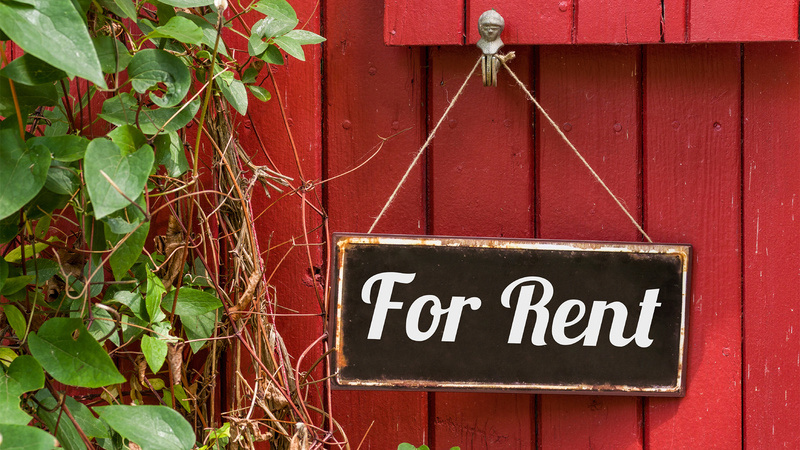 Furthermore, as Millennials marry and have children, they may find few rental options that are large enough or otherwise suitable for families. Moderate-income Millennials who want to buy a home will move to further out neighborhoods. The desire for home ownership will supersede the desire for close-in walkable locations for at least some Millennials. Therefore, these households will “drive ‘til they qualify” to find a home they can afford. Increased demand for housing further from transit and jobs can have negative impacts on traffic congestion and environmental quality in the region, as well as on families that endure long commutes. Some Millennials will leave the region. Some young adults in the Washington DC metro area, including some highly skilled, college-educated workers, will choose to leave the region and move somewhere with a lower cost of living and more options for home ownership. The local economy loses out when workers are forced leave to find more affordable housing. There are no easy solutions to increasing home ownership opportunities for Millennials in our region since this particular housing issue is so closely tied to challenges related to student debt, access to credit and wage and employment growth. However, it is important to continue to support the construction of new housing that is affordable to more moderate-income homebuyers, which could mean changing zoning to allow smaller housing units or residential buildings that fill the “missing middle.” In addition, local governments, businesses and advocacy groups can work together to help identify resources for downpayment or other home purchase assistance for first-time homebuyers. There is abundant research showing that stable and affordable housing is associated with improved educational outcomes among children in low-income families. Access to affordable housing can result in fewer moves and can reduce overcrowding and other housing-related stresses. Housing assistance can help families move to neighborhoods with higher quality schools and housing investments can be part of broader, holistic community development efforts that lead to better outcomes for children. Housing is important to educational outcomes because the school that a child attends is usually determined by where she lives. (Charter schools and school choice in some communities can weaken this link between residence location and school location.) Higher-quality schools—whether measured by test scores, teacher tenure and quality, or availability of resources—tend be located in communities where housing costs and incomes are higher. As a result, when families are segregated by income, it also means their children are segregated by school quality. Unfortunately, income segregation is on the rise for families with children. According to a recent study by researchers at the University of Southern California, between 1990 and 2010, families with children became more likely to live in neighborhoods segregated by income. Over the same period, there was no change in income segregation among families without children. This means that all of the recent increase in income segregation in the U.S. has been among families with children. We know that place matters not just for education outcomes but also for economic mobility opportunities for children, so this recent trend in income segregation among families is particularly concerning. It is not uncommon to hear that “housing policy is school policy.” Housing programs can help lower-income families access neighborhoods with better schools, and can help alleviate the concentration of poverty in neighborhood schools. But what housing policies have worked the best to help families access good neighborhoods and good schools? Inclusionary zoning policies can be a key way to support positive educational outcomes. There are more than 500 local inclusionary zoning (IZ) programs across the country, and many of the jurisdictions in the Washington DC region have IZ or IZ-like affordable housing programs. Research has found that affordable units produced through an IZ program are more likely to be located in low-poverty school districts than housing opportunities created through either the Housing Choice Voucher or Low-Income Housing Tax Credit programs. IZ is not a silver bullet for connecting children to high-quality schools, however, and program design matters. A RAND study has shown that Montgomery County’s MPDU program has been singularly effective at locating housing in low-poverty neighborhoods, which has led to better academic outcomes for children in those homes. 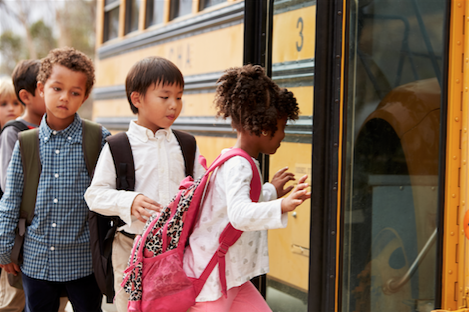 Voucher mobility programs can be effective at connecting families to neighborhoods with high-quality schools, but intensive search assistance and other supports seem necessary. Research on the federal Housing Choice Voucher (HCV) program has generally found that while the program helps families find housing they can afford, families receiving a voucher tend to live in neighborhoods with low-performing schools. Housing search assistance and pre- and post-move counseling can make a voucher program much more successful at getting families into housing in neighborhoods with good schools and ultimately lead to better educational outcomes for children. Furthermore, the most effective housing mobility programs operate at a regional scale, streamlining the porting and the administration process across jurisdictions. The housing tax credit allocation process is another important mechanisms for expanding housing options in neighborhoods with high-quality schools. Tax credits are allocated to the states from the Federal government and a state entity (e.g. a state housing finance agency) awards credits on a competitive basis to projects that meet criteria and recommendations set out in the state’s Qualified Allocation Plan (QAP). 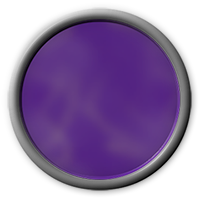 (Nine-percent credits are awarded competitively.) The QAP and the allocation process can have a big impact on the number and types of affordable projects that get built in neighborhoods with good schools. According to a recent report by Enterprise Community Partners, states can prioritize access to good schools in their allocation processes. Maryland, for example, has the option to increase the eligible basis of projects if they offer “reasonable access to jobs, quality schools and other economic and social benefits.” But the link between housing and good schools is not often an explicit part of a state’s QAP. These policies can help families access housing they can afford in neighborhoods that have good schools. But it will never be possible to move everyone. Just like other approaches to connecting families to opportunity, developing joint housing-school policies should be a “both/and” proposition—both investing in housing in high-opportunity neighborhoods with good schools and investing in existing communities to improve neighborhoods and schools. And no matter the policy approach, it is an important first step to ensure that people who care about schools and people who care about housing—who all care about the quality of life of families and children—are talking and working together. Housing Virginia recently convened a group to explore and improve the connections between affordable housing and schools. As we head back to school, thinking about how to do more of that collaboration is essential for ensuring all students have a successful school year! Demand for rental housing has increased dramatically in recent years, and despite a surge in new multi-family construction, many individuals and families still face daunting affordability challenges. 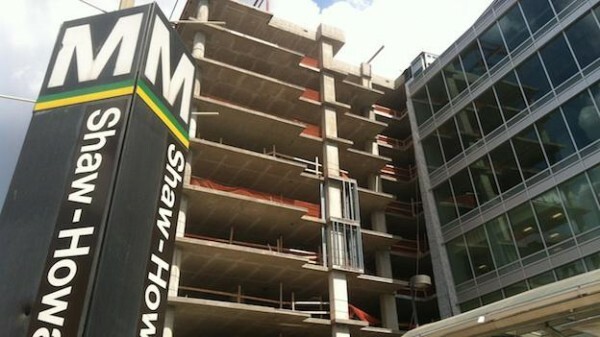 In many parts of the Washington DC region, new construction has ramped up to meet the growing demand for rental housing. However, these new apartments largely target the upper end of the market. Unfortunately with this new market-rate construction, existing affordable housing is often demolished. While it is critical to continue to promote policies that encourage the production of new affordable rental housing it is preservation that is perhaps more important. Across the country and throughout our region, the most important source of rental housing that is affordable to lower-income households is found within the existing housing stock. Subsidized affordable rental housing continues to be at risk of becoming unaffordable due to expiring affordability contracts. Unsubsidized, or market affordable units, which comprise the largest share of affordable rental homes, are lost as a result of demolition as well as improvements and upgrades that lead to rent increases. As the demand for homeownership swings upward again, condo conversions will also put pressure on the existing stock of affordable rental homes. 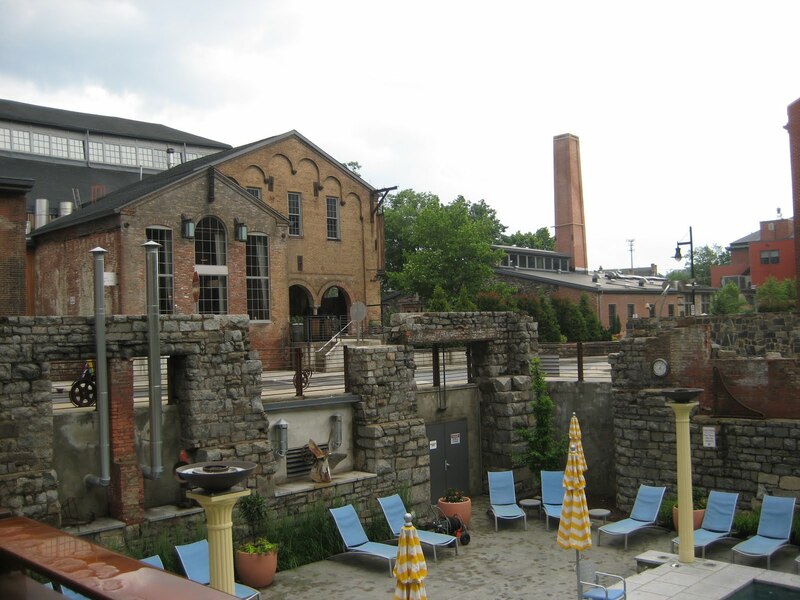 Preservation is a challenge, particularly in high-cost regions like the Washington area. The challenge is even greater in areas that are best connected to opportunity—those near transit and jobs—and neighborhoods that are improving as a result of gentrification. There is a strong case that these are the places where housing affordable to lower-income individuals and families is most needed, but it’s also where preservation can be most expensive. But preserving existing affordable housing is often much more economically sound than new construction. According to one study of preservation efforts in 37 states, the cost to rehab a unit was half the cost of building a comparable new unit. ii) ensuring sufficient resources to leverage preservation opportunities when they become available. Because preservation is so challenging in high-cost areas, a set of strategies is called for. Many of the more inventive and effective preservation policies have been adopted by local jurisdictions in the Washington DC region…but there may be opportunities to expand the reach of existing preservation tools. 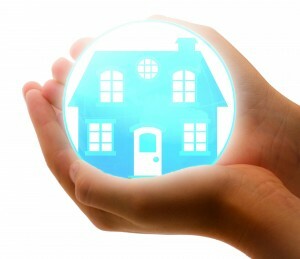 Inventories of At-Risk Properties. The effectiveness of any preservation program depends on the timely identification of at-risk properties. A comprehensive data collection effort can help local jurisdictions identify which affordable rental properties appear to be at risk of loss (including the reason behind it) and target outreach and preservation efforts accordingly. The recently created National Housing Preservation Database tracks at-risk, subsidized properties throughout the country. The District of Columbia’s Preservation Catalog provides a local example of a database that includes information on subsidized properties in DC which may be at risk of being lost from the affordable stock. It is important to keep track of subsidized units with expiring contracts, however, it is equally—or perhaps even more important—to be able to identify and track market-rate affordable units. With support from the Metropolitan Washington Council of Governments, developing a regional database of market-rate affordable rental properties would be a worthwhile endeavor. Notably, inventories developed for tracking are only useful for preservation when a jurisdiction has an acquisition strategy. To be effective, the strategy would have to include a funding source and a process for working with developers when market-rate affordable properties become available for sale. Property Tax Abatements and Exemptions. Some local jurisdictions have attempted to help preserve affordable rental housing by offering property owners tax incentives in exchange for preserving units as affordable—Chicago and New York City offer two examples of fairly comprehensive property tax abatement/exemption programs. Here in the Washington DC region, Fairfax County has a property tax exemption option for non-profit property owners that serve extremely low income households. In many cases these tax incentives are designed to make it financially feasible for owners of low-cost rentals to make improvements to their properties without raising rents to levels unaffordable to low-income residents. Preservation tax incentives tend to be most effective in neighborhoods where rents are not yet rising significantly – this highlights the importance of tracking at-risk units and developing ways to predict neighborhood change. 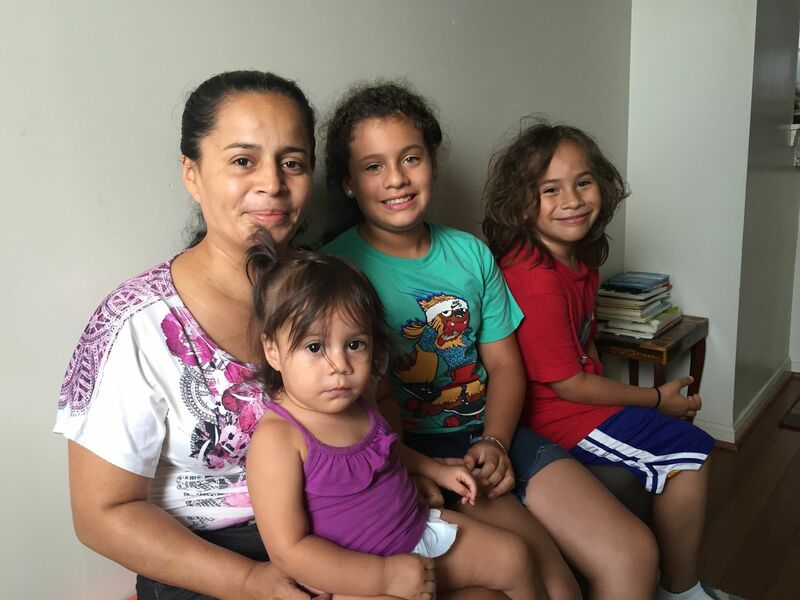 The Pena Family are long-time residents of the 1425 T Street, NW Cooperative in the rapidly gentrifying 14th Street Corridor. 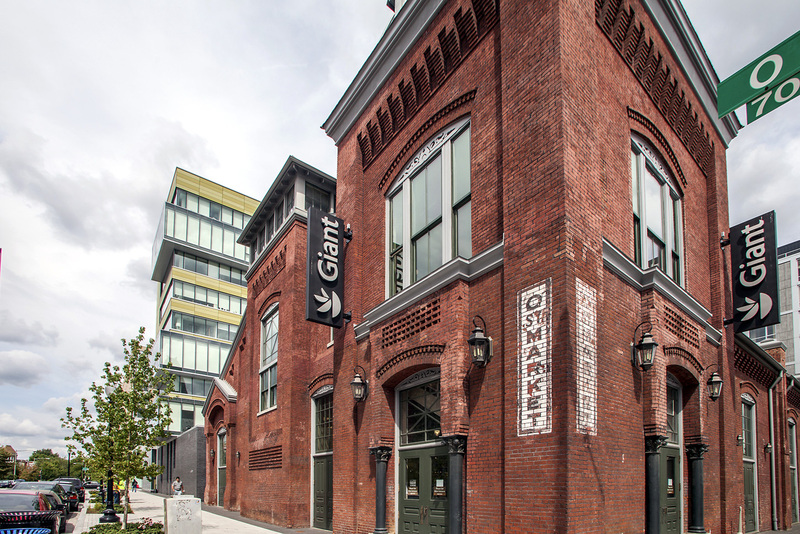 City First worked side by side with the co-op to structure over $2MM in creative financing so members could retain ownership and complete renovation of the property. Right of First Refusal. Right of First Refusal (RoFR) policies can require owners of rental properties to give advance notice of the intention to either sell the property, make substantial property improvements, or convert to condominium ownership, and then requires that a preservation buyer has an opportunity to match a purchase offer. In some cases, the tenants or the local jurisdiction indicate the intent to make an offer, though the purchase is usually made by a non-profit developer. For a RoFR policy to work well, there must be a capable buyer that has experience purchasing and operating rental housing. In addition, the buyer needs quick access to capital to close the transaction. Local funding sources that can respond quickly and flexibly to requests from nonprofits and tenant groups seeking to purchase and rehabilitate at-risk housing can therefore enhance the effectiveness of RoFR policies. Several jurisdictions across the region, including the District of Columbia and Montgomery County, have RoFR policies though their reach has been limited by very high property prices and insufficient resources. In many ways, preservation policies are harder to create than policies designed to promote new affordable development. However, as rents continue to rise, it is critical to stem the loss of existing affordable homes. If not addressed, low- and moderate-income individuals and families in our region will face dramatically declining housing options. Although there is no universally-accepted definition, gentrification is generally thought of as the movement of higher-income – usually white households – moving into lower-income, often minority, city neighborhoods. However, there’s no doubt that gentrification is associated with rising rents and home prices, which can lead to displacement of lower-income individuals and families. There can be positive outcomes associated with gentrification, however, especially when higher-income residents move into a neighborhood: higher local tax revenue for public services, increased business investment, reductions in crime and improvements in test scores (if higher-income families send their children to neighborhood schools). Still, the potential disadvantages of gentrification are also quite clear—in addition to displacement of existing residents, there can be a loss of community identity and a shift in both public and private services away from disadvantaged neighborhoods and into higher-income parts of the city. 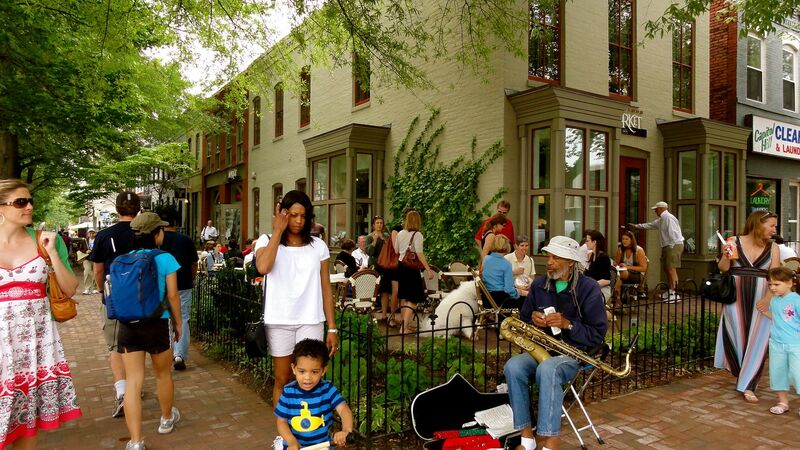 Washington, D.C. neighborhoods have been at the forefront of change, nationwide. In fact, D.C. is one of four major cities in the U.S. where more than half of the neighborhoods gentrified between 2000 and 2010, according to Census track data. It is difficult enough to create and preserve affordable housing options in a high-cost city like D.C., but when gentrification – which can happen very quickly – evolves it can be even harder for local governments and advocates to act and help ensure neighborhood change benefits those already living in the community as well as new residents. Strategies for acquiring existing affordable buildings, or securing land for new affordable housing, often depend on being able to plan ahead. 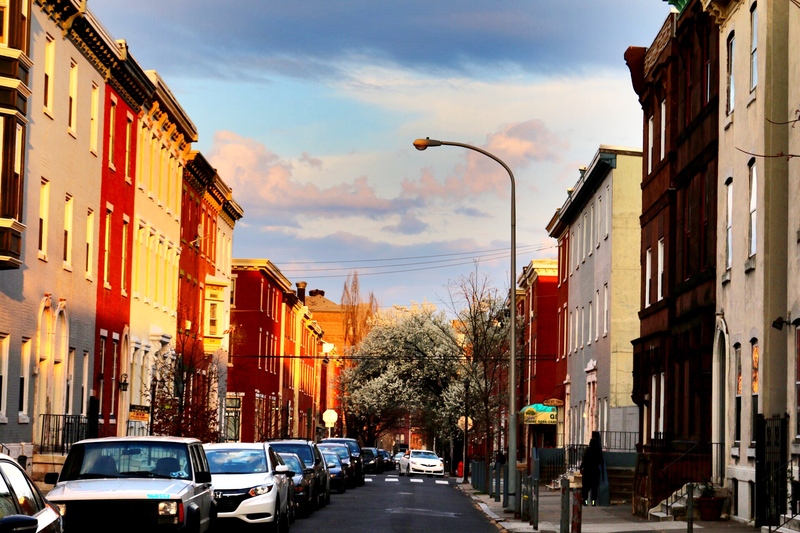 Gentrified or gentrifying neighborhoods are often identified by using Census data to look at the characteristics of residents and the housing stock. Places where there have been increases in the median household income, the median home value and rent and the share of residents with a college degree are often characterized as gentrifying. These local data points provide a good trajectory of the history of change in a neighborhood but they are not very good at predicting change. In most cases, if Census data are used to identify gentrifying neighborhoods, it is already too late. Interested stakeholders find that it is already too expensive to acquire buildings or land for affordable housing. Recently, researchers have been investigating ways to use public and proprietary data to predict neighborhood change. If these forecasting methods could be used in the Washington, D.C. metro area, non-profit developers and other affordable housing advocates could be better able to plan – and more individuals and families could benefit from having access to affordable housing in improving areas. Researchers at the Center for Community Innovation at University of California at Berkeley were interested in the relationship between transit investment and neighborhood change in the Bay Area. They developed an index to predict a neighborhood’s susceptibility for future gentrification. They used data from 1990 to 2000 to build a model that explained neighborhood change, and used that model to predict what neighborhoods would look like in 2010 and then compared their predictions to the actual 2010 data. From this exercise, the key factors that predict whether a neighborhood is susceptible to gentrification are: 1) availability of public space amenities (e.g. small parks, public parks, youth facilities) and public transportation; 2) income diversity (e.g. a relatively even mix of households at different income groups); 3) places where renter (but not owner) cost burden is high; and 4) places where there is a relatively large share of non-family households. The third and fourth data points are suggestive of households that would be able to move easily, thus freeing up housing for gentrifiers. Researchers at New York University’s Furman Center recently examined the relationship between local crime statistics and gentrification; these results could potentially help predict areas of gentrification. Using special tabulations of Census data for tracts in New York City, they looked at households that ha d recently moved into an area and analyzed the characteristics of those movers alongside characteristics of the neighborhoods, including recent trends in crime. They found that high-income, college-educated households are equally likely to move into both low-income and high-income neighborhoods when crime rates have fallen. These households are much more sensitive to drops in crime rates than were lower-income, less educated households. Thus, falling crime rates—and particularly violent crime rates—could signal imminent gentrification. The most innovative use of data to predict gentrification has come from a study in London. Researchers at the University of Cambridge were interested in developing a model to predict which neighborhoods in London were likely to gentrify so that local policymakers could be better position to mitigate negative effects of gentrification while promoting equitable economic growth. The researchers were able to use 2010 data from Foursquare and Twitter to analyze the places individual users “checked in.” They were able to combine these data with basic information about the users themselves and link the users to friends who also “checked in” at the same locations. Then the researchers analyzed the demographic and socioeconomic characteristics of different neighborhoods five years later, in 2015. Basically, the researchers found that when higher income people began visiting unfamiliar locations in so-called “materially-deprived” neighborhoods, these neighborhoods were most likely to gentrify. Conversely, places that were more likely visited by only locals or regulars – and places that were either predominately very low-income or very high-income – were less likely to be gentrified five years later. Understanding where gentrification will occur in the future could be important for local housing staff, planners and developers to plan for strategies to preserve affordable housing options in neighborhoods set to experience increases in housing costs. Some of these methods involve a fair amount of data collection and analysis. However, it is possible that by working both regionally and collaboratively—with developers, local governments, researchers and foundations—we could do a better job at forecasting gentrification and ensuring all individuals and families benefit from neighborhood change. 0 Comments/in HAND News, Member Events & Success Stories, HAND Thought Leadership /by H.A.N.D. 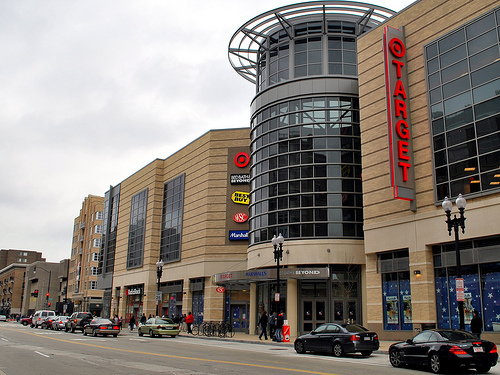 The Washington, D.C. area economy is the in the midst of dramatic restructuring – largely as a result of declines in federal spending in the region. A group of business and community leaders, along with advocates, philanthropists and funders, have come together to work on strategies for repositioning the regional economy to ensure that the Washington, D.C. area is able to compete in today’s global economy. So, according to the Regional Roadmap project, having sufficient affordable housing is vital to the region’s economic future. The growing recognition of the link between housing supply and economic growth is not unique to the Washington, D. C. region. In a 2013 report, researchers Chris Benner and Manuel Pastor found a strong relationship between regional economic resiliency and economic integration. Last year, researchers Chang-Tai Hsieh and Enrico Moretti concluded that the lack of a sufficient supply of housing has reduced U.S. GDP by 10 percent. They also explicitly linked the economic loss to excessive regulation in the housing market which has precluded the building of enough housing. The Chairman of President Obama’s Council of Economic Advisors—a non-housing official—said that restrictive local land use regulations are contributing to increasing inequality and declining productivity, nationally. Is Regional Cooperation on Affordable Housing Likely? All of the partners involved in the Regional Roadmap project seem to agree that regional cooperation and collaboration is key to the success of the initiative and to building a vibrant, sustainable economy. However, regional cooperation on housing issues is probably more difficult than on any other issue identified in the project. Why is a formal regional compact (or a collaborative) on housing unlikely in the near term? No good models. It turns out that there are very few models, from around the country of regional efforts that have had a meaningful impact on the production or preservation of affordable housing, specifically in Baltimore, Illinois and with the Northwest Regional Housing Authority. The regional initiatives that have been adopted in other parts of the country are quite modest, and have tended to focus on a regional approach to allocating housing choice vouchers. Furthermore, there are no examples of regional collaboration on housing issues across multiple states (or state-like entities), such as what we have here in the D.C. region. Other more urgent challenges: Fix Metro. While housing is definitely an important issue, the region is currently grappling with a more immediate challenge—Metro. Local elected officials, business leaders and community members are focused on making sure Metro remains a viable transit system. There seems to be little opportunity to use this possibility as a way to bring stakeholders together to work more generally on regional issues. Despite the hurdles with a formal regional initiative around affordable housing, there are several things that advocates, developers, planners and other stakeholders can do to keep the attention on the region’s housing needs and to move towards a more coordinated approach to expanding housing options throughout the metropolitan area. Collaborate in some way on fair housing assessments: Under HUD’s new Affirmatively Furthering Fair Housing rule, local jurisdictions must use new data, and follow a new process, for assessing fair housing issues and identifying strategies for expanding housing options. Currently, there are no federal requirements or local pushes for a regional fair housing assessment. However, there may be opportunities for housing planners and other stakeholders from local jurisdictions—with leadership from the Metropolitan Washington Council of Governments (MWCOG)—to work together to analyze HUD-provided data and assess regional conditions as part of local fair housing assessments. Share best practices across localities. In addition, regional organizations, including the MWCOG, the Greater Washington Housing Leaders Group and HAND, should continue to find ways to bring area housing planners and elected officials together to talk about local land use and effective financial strategies used in their communities to facilitate the production and/or preservation of affordable housing. These meetings should go beyond the high-level program descriptions and discuss the nuts and bolts of garnering support, implementing the program and following through on measuring outcomes. Learn more about how to communicate. We are probably not going to come up with a new approach to housing that has never been tried before. In fact, the local jurisdictions in the Washington, D.C. area tend to be leaders on affordable housing policy among communities across the country. Instead, we need to focus less on documenting the need (it’s considerable!) or identifying best practices (we know what they are!) but rather on how to communicate with residents, neighbors, community groups and elected officials to make a better case for action—both at the local and regional levels—especially considering there are so many competing needs and conflicting priorities. Achieve small regional successes. Although a large-scale regional housing initiative in the Washington, D.C. region might be a long-term goal, in the immediate future there are opportunities for local jurisdictions to work collaboratively on a smaller scale. Last year, the District of Columbia, Prince George’s County and Montgomery County agreed to work together towards eliminating homelessness. Other potential regional efforts could involve a subset of local jurisdictions to advocate for at the state-level. Successful, smaller initiatives can help build trust among local leaders and lay the groundwork for more comprehensive regional housing efforts.